First things first, who's AUrate? 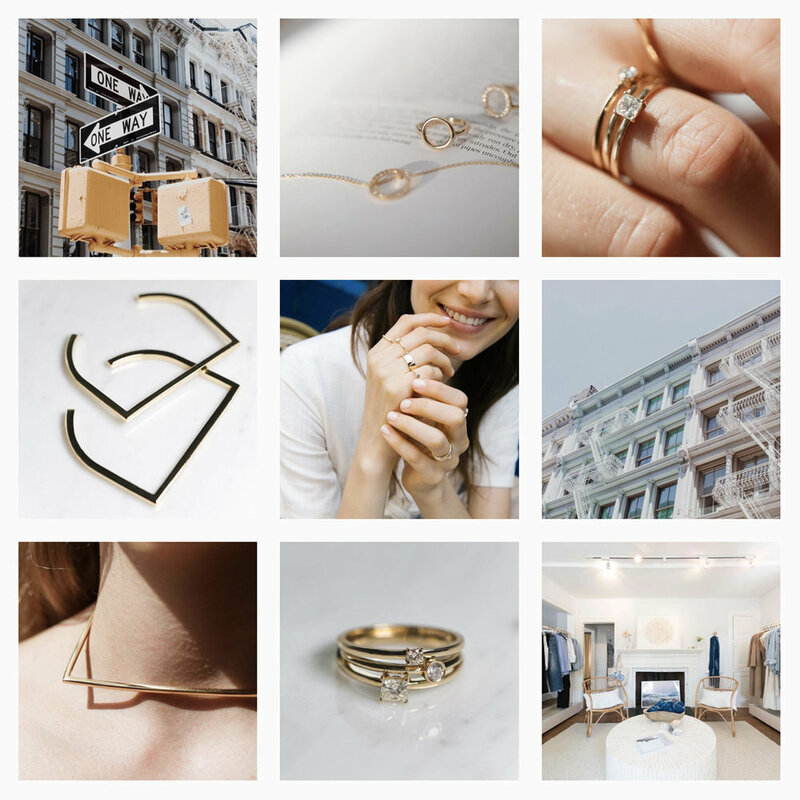 Well if you haven't heard already, AUrate is a fine jewellery brand from New York who's poised to disrupt the current jewellery industry by offering ethically sourced and beautifully designed pieces at an extremely affordable price. Say, about 75% less than the current market prices. How? AUrate sells directly to customers which means that there are no wholesale or retail markups at all. They also steer clear of pricey ad campaigns and rely solely on customers' recommendations as their means of advertisement but really... when a brand is simply that perfect, there isn't a need for any extra embellishing. Oh, and let's not forget to mention that AUrate also donates a book to underprivileged children with every purchase. Their partnership with Mastery Charter aims to raise literacy rates by putting a book directly in the hands of a child who needs it. Okay, that's enough 411 I think. Let's talk about my own experience and why I wholeheartedly support AUrate. As you all know, I have been on a slightly crazy streak when it comes to jewellery - especially gold jewellery! It's all I can think about and it's the only thing I am obsessively wearing and lusting after every single day. Traditional gold however, has always come with many environmental impacts and social issues. There's the correlations with trafficking, human right's violations, deforestations, ravaged landscapes, forced removal of indigenous people and even death. Surely, small gold sparkly things aren't worth all these atrocities so as part of my own personal quest towards a more conscious and sustainable lifestyle, I vowed to only purchase jewellery that are mindfully made with responsibly sourced materials by small jewellery makers. I started with Etsy of course but there will always come a time where you'll start wanting something more... and my time came. I had just graduated my masters (with a distinction at that) and I wanted to gift myself for all the hard work I've put in and to sort of commemorate the end of my educational life but I simply couldn't justify spending a large chunk of money on a piece of jewellery even if it is extremely sparkly. Here I was, moving apartments and about to enter the real world... so no, I couldn't just spend thousands on one item. Enter AUrate. Okay full disclosure, I was contacted by them back in June about a collaboration but didn't hear anything back for a month. I obviously did my own research after the initial contact, read up on them and was really taken aback by their ethics and philosophy. I have never come across a brand that's like theirs especially not ones that are also affordable. You know we've heard of Chopard's initiation for ethical gold mining but the cheapest pieces on offer are still four figures. I mean, that's a lot. There are obviously local jewellery stores that I could walk into but I couldn't trust not knowing where or how the materials were sourced. So with AUrate, it felt like I hit a gold-mine (HA!). Fast forward to a week ago, my parcel arrived. 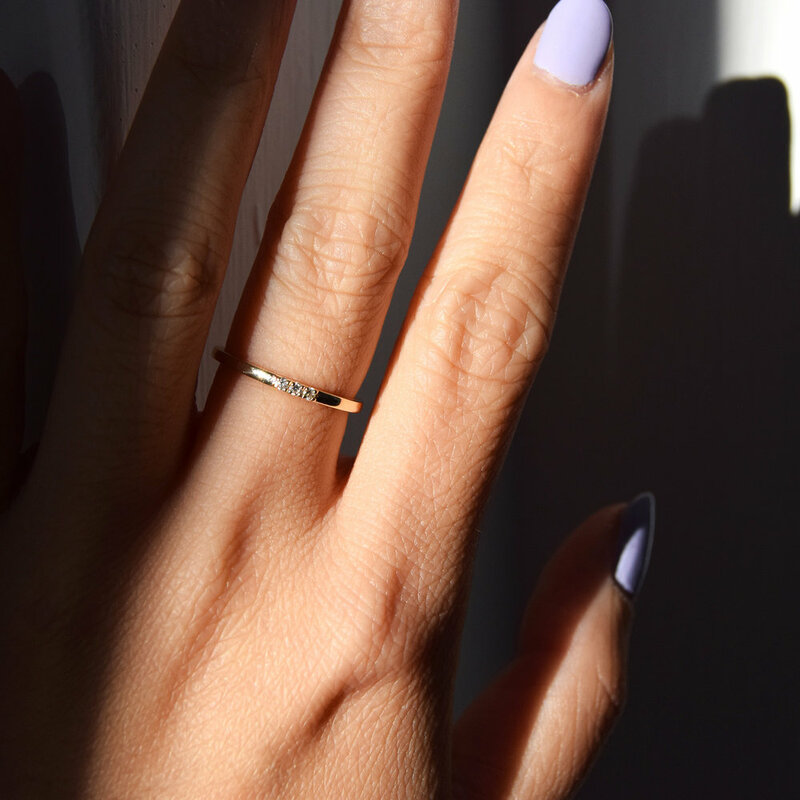 It took slightly longer than it would if you had an average ring size but mine on the other hand, was made-to-order cause I have tiny fingers. 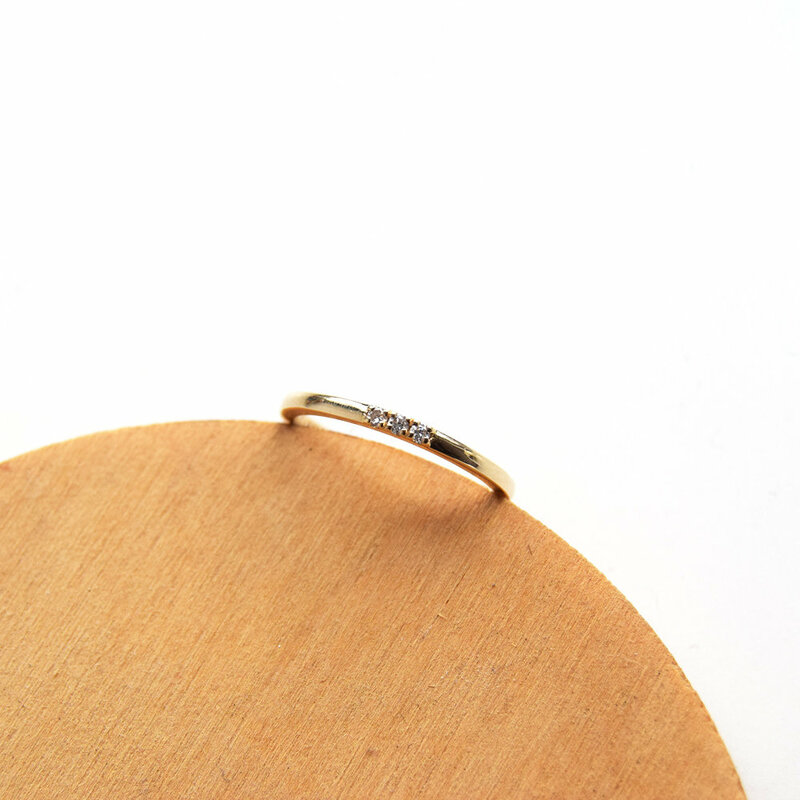 TLDR: Meet my extremely gorgeous, impeccably beautiful, very sparkly and oh-so-perfect stacking diamond ring. Yes! Real diamonds! 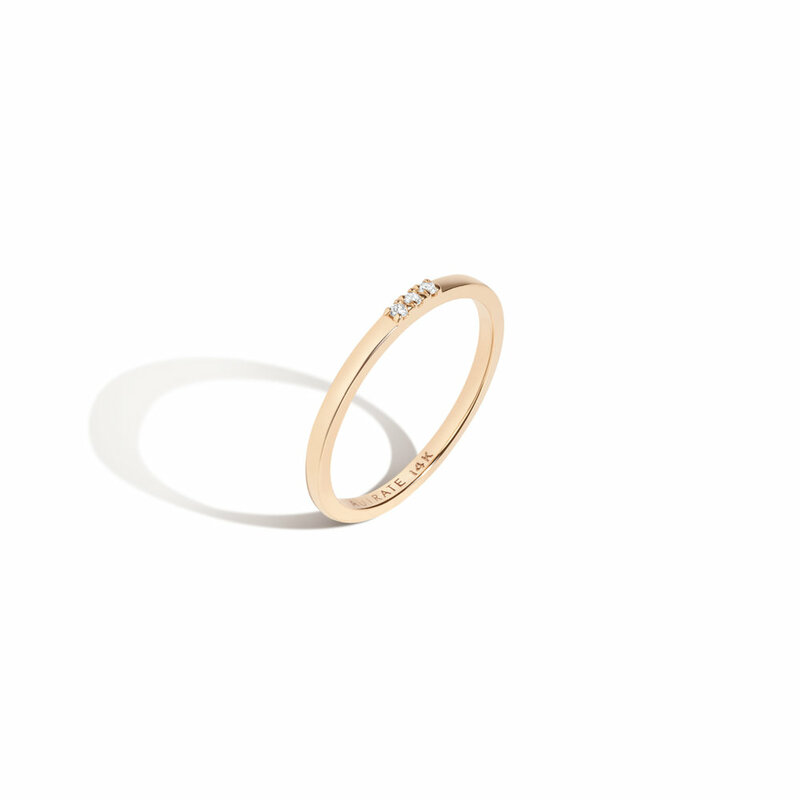 Made out of 14k gold and available at the price of only £194! Specifications: 3 Round brilliant diamonds (SI Clarity | 0.04 carat) and prong set atop a delicate gold band measuring 1.45mm. Comes with a lifetime quality guarantee too. 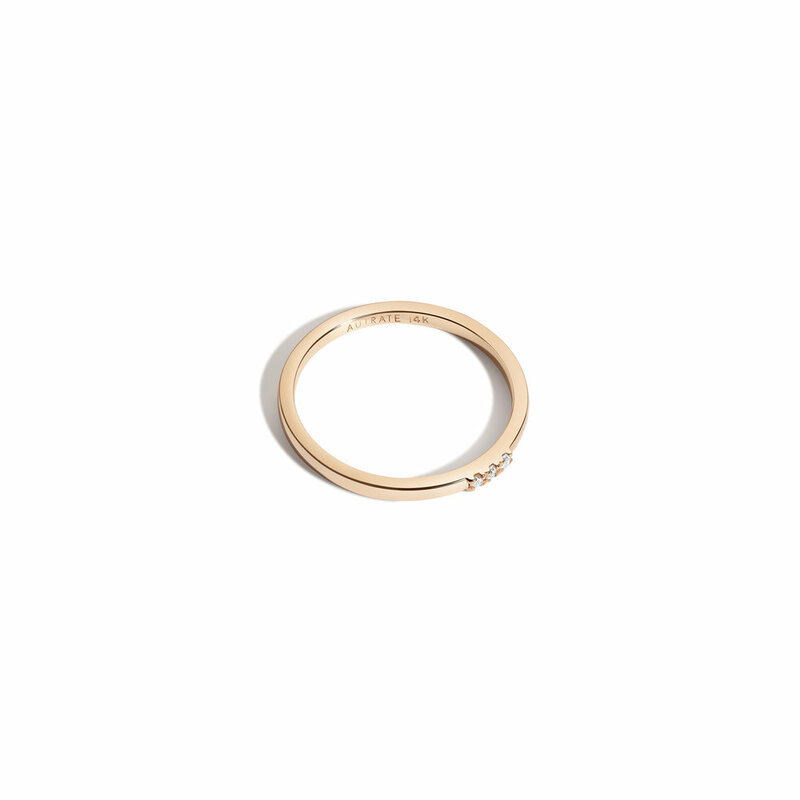 In comparison to any other ethical luxury jewellery brands available, a diamond stacker ring like this will easily cost you a full four figure but AUrate's fair pricing reveals the true price point as it only charges for the materials, craft and effort. Hand to heart, there's really not much else I can say about AUrate other than wow. Whether it's shopping for yourself or for your loved ones, I hope you look to AUrate and discover the guilt-free joys of wearing one of their designs. 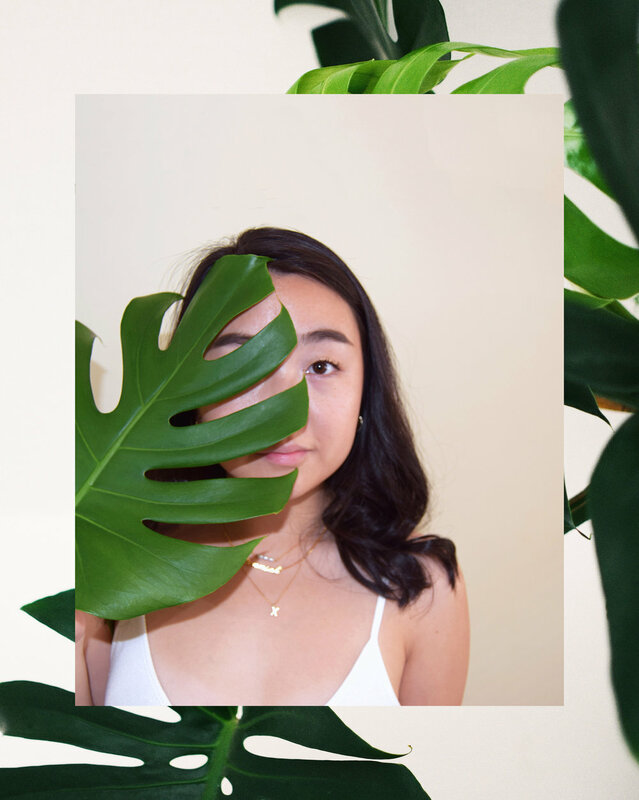 It's simple, minimalist and definitely an affordable ethical luxury brand we can all enjoy. Plus, prices start from as low as £21 per piece - I say it's time to slowly transform your wardrobe and build one that lasts a lifetime. Head on over to AUrate New York. Read about them in Forbes, Business Insider and Marie Claire. PS: This item was generously gifted by the amazing team over at AUrate!